The Handpresso Pump is an ideal coffee device. Whether you are walking in the Lake District, on a long car journey or you fancy a quick espresso, this is the device for you. As long as you have hot water, you can have an espresso ready in literally a minute. It is entirely eco-friendly as it doesn’t use any electricity to power it. Your coffee is brewed by using your hand to pump the machine, similar to a bike pump. If you are looking for a device that is easy to take around with you, brews coffee quickly and is eco-friendly, look no further. 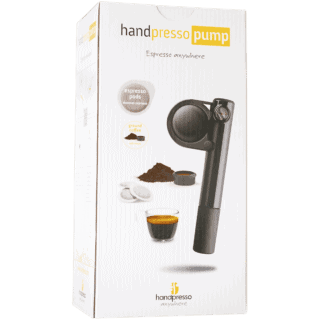 If you already own a Handpresso Espresso Pump and are wanting some assistance on how to use it, then read on my friends, read on. Alternatively, if you need some convincing on just how easy they are to use, read on just the same. Let me begin by saying, if the Chemex is the most romantic looking brewing device with its clean lines and visible filter action – the Handpresso Pump is the sexiest! Opening the smart black box to find the gloss & matte black Handpresso is a source of excitement! Upon receiving your Handpresso, it’s best to wash it with warm water before use. The Handpresso is not dishwasher safe and should not be cleaned with detergents as this can taint your brew. The Handpresso can use ‘easy serve espresso’ coffee pods or fresh ground coffee. As we roast our own, we will remove the coffee pod adapter. If you need to remove your ESE pod adapter, place a coin in the slot and turn counterclockwise for the adapter to release. Before pumping the Handpresso to pressure, check the infusion button is up. Next, release the pump by twisting the handle. Observing the pressure gauge, pump until the needle reaches 16bar (the green segment in the gauge). Now you have pressurised the Handpresso, turn it over and remove the filter housing by rotating. You will see the white line on the housing to help you realign it later. 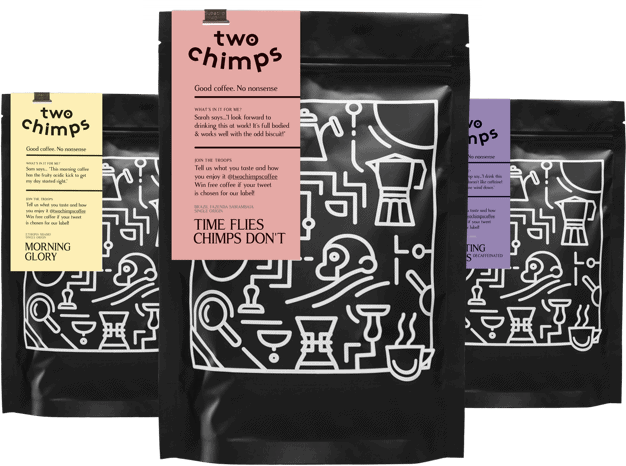 Remove the coffee ground holder and fill with your favourite Two Chimps espresso grind. Tamp it down firmly using the back of the spoon – 7grams is the ideal weight if you have the facility to weigh your grounds. You can purchase a unique tamping device from Handpresso if you wish. Now carefully fill the reservoir just to the cradle with recently boiled water. Don’t be surprised at the small volume (50ml). Place the ground holder carefully into the Handpresso and fix the filter holder in place. Flip the pump over and place over your demitasse, push the button to allow the pressure into the reservoir and there you have it, an excellent cup of espresso! After use, remove the ground coffee adapter from the pump. BEWARE of the hot water which may still be in the water reservoir. Remove the coffee puck from the ground coffee adapter by squeezing the sides and pressing the mesh filter. Rinse the ground coffee adapter ready for your next brew. Followed this guide but don’t own a Handpresso Pump?